Wild Tornado is a multi-provider online casino site offering 500+ games from the world’s best software providers. Licensed in Curacao, Bitcoin-friendly and in operation since 2017, it has a lot to prove when it comes to standing out from the crowd with better bonuses, promos and features. This review takes a look at its current bonus offers, games catalogue, licensing and security, payment options and overall experience to help you decide if it’s the right fit for you. Who can play at Wild Tornado? Wild Tornado accepts players from a wide range of countries, and with multiple languages supported including English, Finnish, French, German and Swedish, it is a potential real money casino option for many of our international readers. Unfortunately, at the time of this review, Wild Tornado does not accept players from the following countries: France, Poland, Spain, Ukraine, United Kingdom and United States. In our experience, the three-tiered welcome bonus is fairly standard as are the bonuses offered here at Wild Tornado, but it’s definitely good value nonetheless. The minimum amount you can deposit while still qualifying for the bonus is €/$20/0.01 BTC. There are some restrictions that all new players must note, which we found somewhat average. The free spins are credited automatically after your qualifying deposit and they have to be activated within 2 days; you can do so by visiting your personal user account page and navigating to the bonus section to activate your spins. You also must use your free spins one day after activation, which is an unnecessary limitation we haven’t faced much elsewhere. The wagering requirements at Wild Tornado is a significant downer when it comes to their bonuses. All of their free spins are subject to a 50x wagering requirement, and all match bonuses are subject to a 40x wagering requirement, making it some of the highest for any newly launched online casino site in 2017. Compared to others offering wager-free bonuses or much lower playthrough rates, and in this regard, Wild Tornado does not make a great first impression. Additional terms and conditions and other information on how to find your bonus balance on-site are outlined fairly clearly in Wild Tornado’s handy FAQ section, which deserves minor props. It is a lot more thorough and detailed than many other online casino sites bother to fill so take the time to read them. Also, never gamble more than you can afford. Wild Tornado offers a number of weekly player promotions for members to take advantage of, covering reload bonuses, free spins, one-off match deposit offers, and VIP points progression should you wish to take advantage of their loyalty program, which lets you choose the type of bonus you would like to have awarded to your account during real money play and which unlocks bigger perks the more you spend to get something back. Like the majority of casinos on the Internet, Wild Tornado is a no-download, instant-play online casino site. This means you can access and play all of its games via your Web browser, whether it be computer or mobile, without the need to download any special software. You can test out nearly all of its impressive games catalogue without even creating an account, giving you a decent taster as to the type of games Wild Tornado has on offer. Almost 80% of their software is available on their mobile casino site, which is great for players who prefer to play on-the-go and don’t want less options just because of their platform preference. 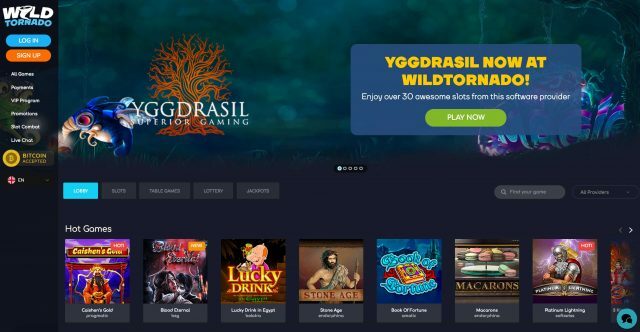 In terms of quantity and quality, Wild Tornado boasts over 500+ online casino games from the very best software providers in the industry, including BetSoft, ELK Studios, Net Entertainment and NextGen. 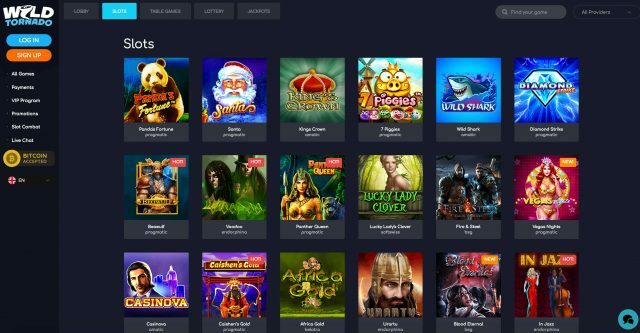 They also have a refreshing number of games from smaller studios or those that aren’t usually as common at other popular online casino sites, such as Ainsworth, Amaya Software, Belatra Games, Endorphina, Pragmatic Play and SoftSwiss. The vast majority of their games selection is made up of slots, but with over 55 table games it’s a decent number compared to many other sites where the balance if most certainly non-existent. Most of Wild Tornado’s games are available and optimised for mobile platforms, too, meaning you can play on your smartphone or tablet device when you can’t sit down on the computer to play. Wild Tornado Casino provides an excellent selection of online casino payment options for players to deposit and withdraw money fast and securely, with SSL digital encryption technology protecting all financial transactions. At the time of this review, multiple currencies are accepted, including: Australian Dollars (AUD), Bitcoin (BTC), Euro (EUR), Norwegian Krone (NOK), Russian Ruble (RUB), Swedish Krona (SEK), and US Dollars (USD). As is standard with online casinos which service the international community, the deposit and withdrawal methods available for you will depend on the country you are playing from – so be sure to check in with the live chat support team, who provided prompt answers to our queries while we were testing the site from multiple regions. *Indicate deposit options that can also be used for withdrawals. In addition, at Wild Tornado all withdraw requests must generally be with the option you used to deposit. If you use a service that does not have withdrawals supported at Wild Tornado, you must use a second option to do so. All players and those thinking about signing up can direct questions or request assistance with any issues they may have by using Wild Tornado’s live chat service, which is open 24/7. Their support team get props from us due to extremely prompt responses, which were both helpful and very detailed. The representatives we spoke to during our testing period generally knew what they were talking about, which is a refreshing change from other sites we you usually have to find a manager before you get clear, unambiguous answers for important questions such as payment processing and regional restrictions. Wild Tornado has a decent number of high-quality, real money online slots and table games software, in addition to multiple language support and a wide range of payment methods suiting players from around the world. However, its high wagering requirements attached to its bonuses significantly lower its value for the average player, new to online casinos or not. Still, it’s a promising up-and-coming site and we hope to see more improvements in the near future to help it stand tall against the long-standing players in the industry.